In early April the long awaited 1940 Census was released to the public. The only problem is that they indexing isn't complete for most of the states. That means that you have to browse - search page by page - for the individuals you are looking for. That is not hard if your family lived in a small town. But a city such as Rochester? There are hundred of pages. How would I ever find my parents Stillman and Margaret Cook? Luckily I happened to have a Rochester city directory for 1940. They were listed at 48 Mayberry Street for that year. If they didn't move before the census taker came, it would really help with the search! The next step was checking to see if 48 Mayberry still exists - if you have the cross streets it is even better. Using google, I found that the address does indeed exist - they lived in the middle of a small block between Atlantic Avenue and Leighton Ave on the east side of Rochester. That narrowed down the search to about 30 pages on ancestry.com. As I browsed through the pages I looked for Mayberry - and found it! But alas, it was the odd side of the street. 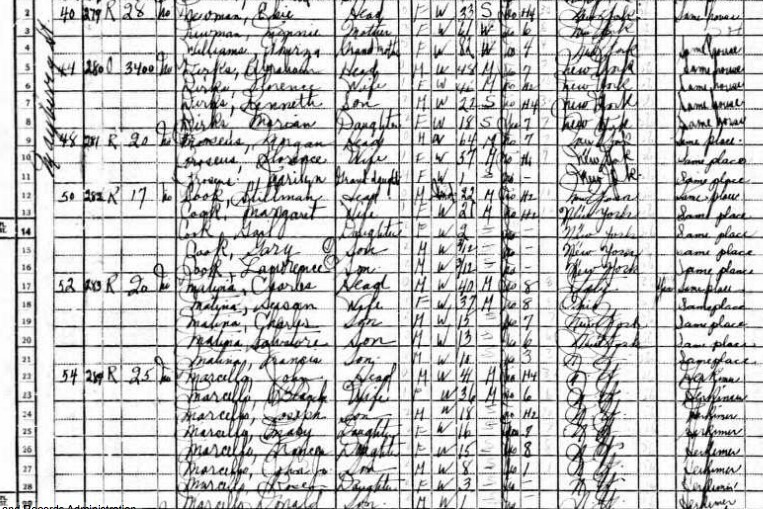 The census taker then moved on to the next street. It was several more pages before they returned to do the even side of Mayberry - and there they were! You will find them between the Proseus and Matina Families in the middle of the image. The first column is the house number, so they actually lived at 50 Mayberry. It was probably an apartment, perhaps upstairs or in the back of the house. "282" means the Cooks were the 282nd family visited by the enumerator taking the census. Th next two columns are interesting: They rented "R" and their monthly rent was $17.00 a month, the cheapest on the page. It may have been small for a family of five! The kids were too young to be in school, and both Mom and Dad had quit school after two years of high school. (I believe Mom told me it was the 8th grade, but I might not remember that correctly since "H2" meant they complete their sophomore year.) Only two people on the entire page completed H4, or four years of high school. Below is some addition data found on the page. This is the other half of the data that has to do with occupation and other topics. The three blank lines are for the kids - the top line is Dad, the second Mom. The first four columns ask "Was this person at work for pay or profit in private or nonemergency Govt. work during the week of March 24-30?" "If not, was he at work on, or assigned to, public Emergency Work (WPA, NYA, CCC etc) during the week of March 24-25", and then "Was this person seeking work? If not seeking work, did he have a job, business, etc"
The "H" after Mom's responses means she worked in the household or kept house. The next entry states that Dad was a "General Worker", or a common laborer. The slash is in the column that would have identified the industry. After several codes regarding employment, there is a "28", which indicated the number of weeks he worked in 1939. The 700 is the amount of wages he received in 1939. The final yes of the columns was Dad and Mom's response to the question "Did this person receive income of $50 or more from sources other than money wages or salary? It is not recorded or known where that extra income came from or how much it was. It is clear from this data that the young family was going through some difficult financial times. In 1940 the minimum wage was .43 an hour, and the average income as $1299. Dad had only worked for little more than half the year in 1939, bringing in $700 or $25 a week. That would have been enough to cover his rent (today it is recommended that no more than @25% of monthly gross income goes toward rent), but no one was working. Were they on "relief"? Was Dad earning money playing piano under the table? I remember that Mom used to talk about some hard times. But the family did survive those years. In the 1942 directory Stillman Cook is listed as being employed at Eastman Kodak Company, and the family had moved to 26 Arch Street in Rochester. For Dad and Mom, you can go to New York, enumeration district 65-265 and look at sheet No 14. Happy Hunting!